Promotional Backpacks, Laptop Bags, Cooler Bags and Carrier Bags which can be personalised with your promotional message. 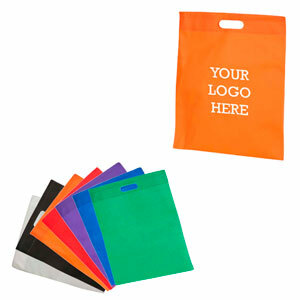 A budget friendly carrier bag made from recyclable non-woven polypropylene material. Choice of bright vibrant colours. Attractive letter-box aperture handles. Colours available: Black, blue, green, orange, purple, red, white. Size: 380 x 455 mm. Print area: 250 x 250 mm.